Vergleichende Ubersicht bekannter Hohen und Orte der Erde uber der Meeres-Flache. 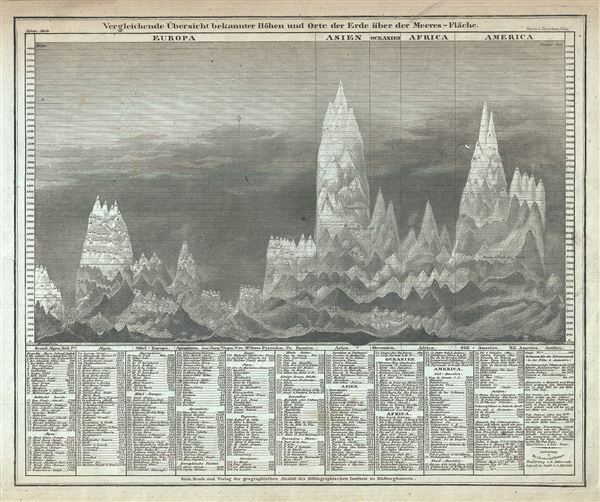 This is an interesting c.1850 comparative chart of the world's mountains by Joseph Meyer. It identifies some 400 mountains drawn in proximity to one another and subdivided by continent. Dhaulagiri, in the Nepali Himalayas is identified as the world's greatest peak. The names and elevations of the various other peaks shown are identified textually at the base of the chart proper. Published in Meyer's Zeitung Atlas.